Substantial and tasty, this is comfort food at its most veggie. Saute the cherry tomatoes, garlic and spinach together in 1 tbsp olive oil over a medium flame, until the spinach wilts and the tomatoes break down. Season to taste. 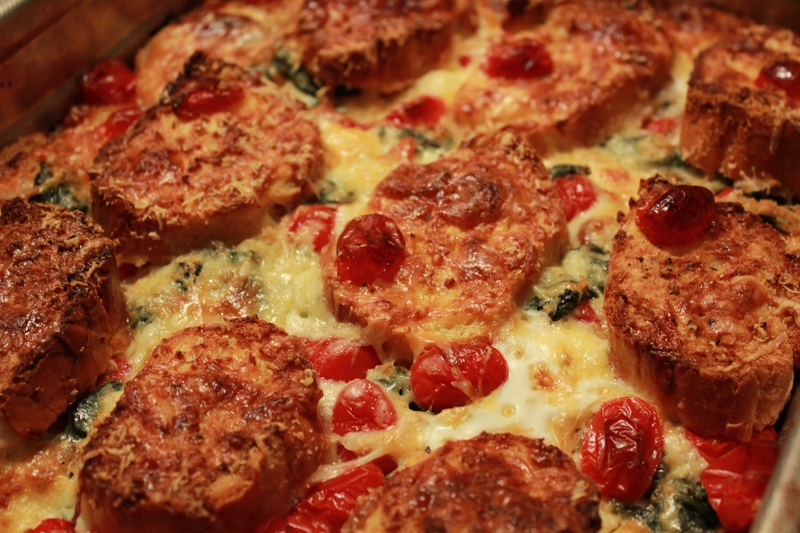 Mix cream and eggs together..
Lay slices of stale bread in a roasting tin. Spread a tablespoonful of the tomato spinach mix over as equally as possible, then sprinkle cheeses and add couple of chunks of mozzarella. Pour some of the cream mixture over the top, then repeat the process until you have used all ingredients. Place in a preheated oven at 200 degrees for 45 minutes. Let cool slightly before serving.